After several hours passed, the NHL said it would be going over the players' new contract offer on Monday night and would get back to the union in the morning. The NHL is the only North American professional sports league to cancel a season because of a labor dispute, losing the 2004-05 campaign to a lockout. The NHL and the players' association will start the new year right where they ended the old one — at the bargaining table. After several hours passed, the NHL said it would be going over the players' new contract offer on Monday night and would get back to the union in the morning. Commissioner Gary Bettman said he expected negotiations would restart Tuesday afternoon. "I'm out of the prediction business," Fehr said. "You get up every day and you try to figure out how to make an agreement that day, and if it fails you try and do it the next day. That's exactly where we are." Bettman also reserved judgment when asked if progress was made. A crowd of people heading toward New Year's celebrations in New York gathered around the large throng of reporters and television cameras focused in on Bettman and Fehr as the two leaders spoke separately on the busy sidewalk. Clearly, both men would rather have the attention back on the ice instead of themselves. This was the first meeting in nearly three weeks since the last round of negotiations with a federal mediator on Dec. 13. After presenting their proposal, union representatives stayed in the building in case there were further discussions — later, with talks done for the day, the union said it expected a response from the NHL on Tuesday morning. The New Year's clock ticked down while the window to reach a labor agreement to save the season was rapidly closing. 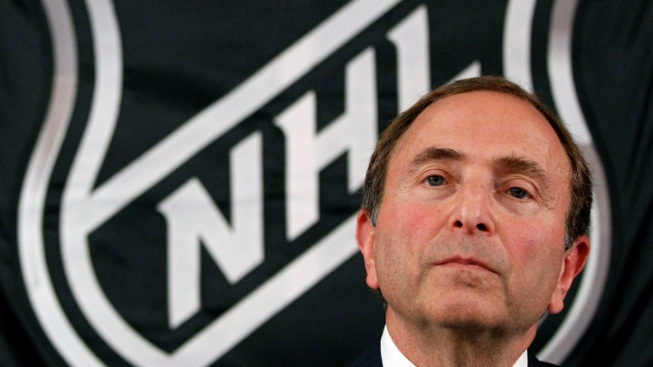 Bettman said a deal needs to be reached by Jan. 11 to allow the season to begin by Jan. 19. That leaves a little less than two weeks to reach an agreement and hold one week of training camp before the puck would drop on a 48-game campaign. So far, a deal has proved elusive and well out of reach. The league and the union had informational discussions — by conference call and in meetings — with staff members that lasted much of Saturday and ended Sunday. Those talks were spurred by the extensive contract proposal the NHL made on Thursday. All games through Jan. 14 have been canceled, claiming more than 50 percent of the original schedule. Bargaining sessions with only the NHL and union hadn't been held since Dec. 6, when talks abruptly ended after the players' association made a counterproposal. The league said that offer was contingent on the union accepting three elements unconditionally and without further bargaining. The NHL then pulled all existing offers off the table. Two days of sessions with mediators the following week ended without progress. Those moves were made because the players' association took steps toward potentially declaring a "disclaimer of interest," which would dissolve the union and make it a trade association. That would allow players to file antitrust lawsuits against the NHL. Union members voted overwhelmingly to give their board the power to file the disclaimer by Wednesday. If that deadline passes, another authorization vote could be held to approve a later filing.